An Excellent Fourth Place - Championship Leaders Now! 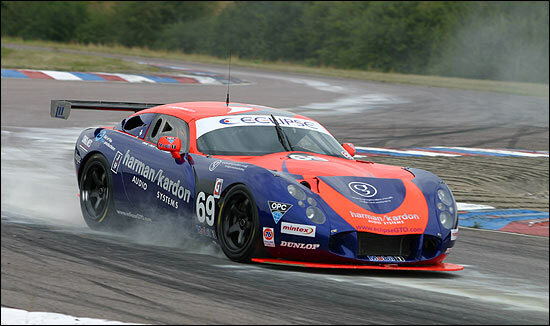 Britain’s fastest road circuit at Thruxton in Hampshire welcomed a quality GTO class grid for the for the 75 minute race. 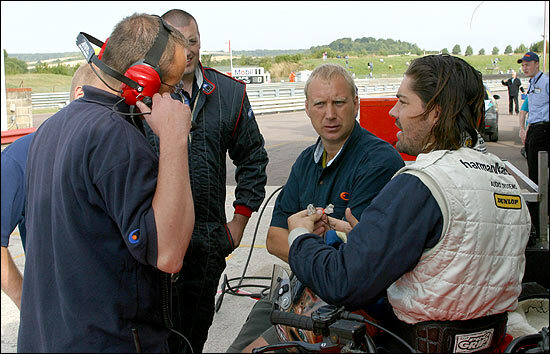 Here was an event which truly brought the extra challenge of the longer races in 2003 to the fore, the teams needing to take account of tyre wear on the notoriously abrasive Thruxton surface, plus fuel consumption over the 75 minute race, to ensure that a statutory two minute fuelling stop would not be necessary. Tactics needed discussing. Fuel consumption was not a concern for the TVR runners though, and two Safety Car periods would ensure that almost everyone raced hard throughout. This time out the regular Championship runners were joined by two guest entries, the 2002 championship winning #88 Veloqx Motorsport Ferrari 360 and the #91 DeWalt TVR T400R. After dominating in qualifying the #88 Ferrari was widely tipped to dominate the race. 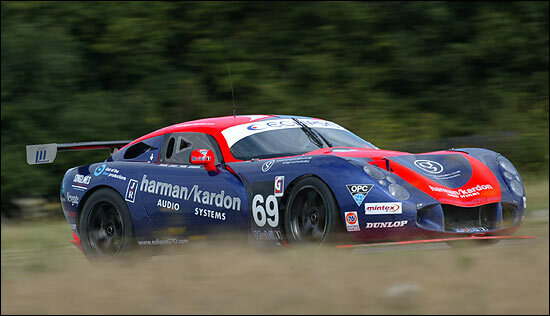 But the Eclipse TVR was right in the thick of the regular entries on Saturday, despite the half hour qualifying session being affected by a trail of oil (and the cement dust that was used to soak it up) around the final part of the lap. Piers Johnson set the fifth best time, but once again, he and Shane Lynch were going to demonstrate that they are a very strong driver pairing – no matter who the opposition happens to be (this week). The only concern was tyres around this most abrasive of tracks, Piers pointing out a little graining of the offside front on Saturday. Tim Mullen in the highly developed FIA GT Ferrari was expected to blast away at the front, and that’s what transpired – but Shane was looking hungry from the lights, nuzzling up towards the Balfe Motorsport Mosler and the DeWalt TVR from the off. Fifth it was though at the end of lap one, Shane pressuring Tom Herridge in the Championship leading Rollcentre Mosler (it wouldn’t be by the end of the race). Mullen may have disappeared up the road, but the next four were pulling away from any challenge from behind – and Shane wanted to move up the order. That came about on lap 6, when Jamie Derbyshire spun out of third place at the Chicane – moving Shane into fourth, and still crawling all over the back of Herridge’s #22 Mosler. He stayed there, applying the pressure, which paid dividends on lap 14 as Shane outbraked the Mosler at the end of Woodham Hill, into the Chicane. 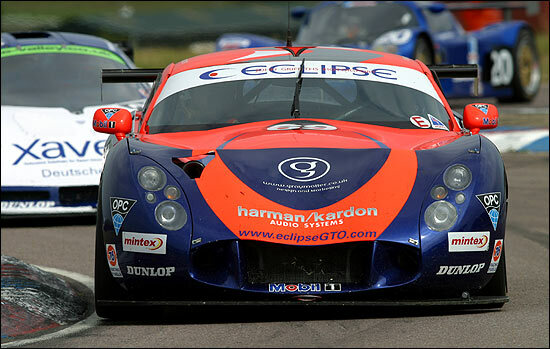 The Eclipse team’s two championship rivals were both behind the TVR – with just the elusive Ferrari and the DeWalt TVR ahead. Herridge slipped further back through the pack on lap 17, then had an unfortunate coming together with the CDL TVR exiting the Chicane, eliminating both on the spot. With the cars in a dangerous position and the tyre barrier requiring attention the Safety Car was summoned, but the driver change window was still some minutes away. The mere appearance of the bright yellow SEAT was bad news for Tim Mullen, an almost 30 second lead was down to next to nothing. With the tyre barrier needing some heavy duty attention, the Safety car period took the race into the driver change window, which was the cue for Shane to pit for Piers to take over. The Dewalt TVR, the Balfe Mosler and a good number of other cars also pitted. Relatively slow stops from the Eclipse and DeWalt teams, with both opting to change tyres, saw Piers Johnson and Mike Jordan rejoin behind a very fast stopping #33 Balfe Mosler. The new order in the train was Mullen - still ensconced in #88 - followed by the Ultima, Mosler and Eclipse and DeWalt TVRs. As the Safety car withdrew we had, in effect, a whole new race but it wasn’t to be a five car chase from the off. The Cup class RML Elise emerged from the chicane very slowly, Peter Snowdon seemingly unaware that the Safety car had been withdrawn. Piers Johnson and Mike Jordan were unable to pass until the green flag at the start-finish line and by the time they did so the three cars ahead had pulled out a substantial margin. Having had a cushion over the surviving championship rival, the red and white Mosler, suddenly Piers was now lagging behind – and he hadn’t done anything wrong! Shaun Balfe was in no mood to be intimidated by the Ferrari’s earlier pace: he passed Scott in the Ultima almost immediately and set off in pursuit of Mullen. Jordan meanwhile had found a way around Piers Johnson and was charging off in pursuit of the Ultima ahead. But Piers was hanging onto the flying #91 TVR, and both T400Rs caught and passed the Ultima with relative ease. The Ferrari would have to pit though and with the Veloqx team suited up in pit lane it was clearly going to be for more than just a driver change. Mullen pitted with just a 16 second gap to Balfe and, as Andrew Kirkaldy jumped aboard, the red-suited crew set about changing both left hand tyres. But there was a problem with the left front and the cure took the team a full 30 seconds to achieve. Kirkaldy would now have a mountain to climb and he emerged from pit lane in fifth slot, 34 seconds behind the new leader, Balfe. Piers was now up to third, in this race of fluctuating fortunes. But the Ferrari was flying again, and Piers was being caught: he had the Ferrari right behind when….we had another Safety Car period. Peter Snowdon had lost the clutch in the RML Elise and spun and stalled in the complex. This time it would be a no doubt rather unhappy Shaun Balfe who would see a hard-won 21 second lead erode to nothing! Jordan and Piers were eager to attack the lead and to ensure that the fourth placed Ferrari, now very large in their mirrors, was either beaten (Jordan) or brought into play to prevent the Mosler taking maximum points (Johnson). Once again though there was deep frustration for the cars pursuing the leader. With the stationary Elise swiftly removed, the cars shaped up for a run by the Cup class cars after the line, but Liz Halliday got it all very wrong in the chicane and ran very wide, over the outside kerbs and onto the grass at the exit. She rejoined immediately but had lost momentum and speed and once again the GTO battle was interrupted by the need for a train of cars to have to trundle down the start finish straight behind a slow moving backmarker. All three powered by the Porsche mere inches after the green flag but Kirkaldy was all over the back of the TVRs. Piers had to let the Ferrari by but Jordan held his own, for now. The Ferrari eventually found a way by, and went chasing after the Mosler. Piers was now in fourth place, his frustration being that with all the incidents in this epic event, his surviving Championship rival, the Mosler, was probably too far ahead of the Ferrari to be caught. So it proved, Balfe upping his pace and hanging on by almost exactly two seconds. But the good news was that the GTO Class had a pair of new Championship leaders: Shane and Piers scored 15 points for fourth place (second among the British GT regulars) and they lead the title chase by two points. What they have to do is to beat the Moslers: their next opportunity is a real treat for sportscar and GT fans, the Spa 1000 kms on August 31, when the British GT runners will share the famous circuit with the prototype cars of the FIA Sports Car Championship. 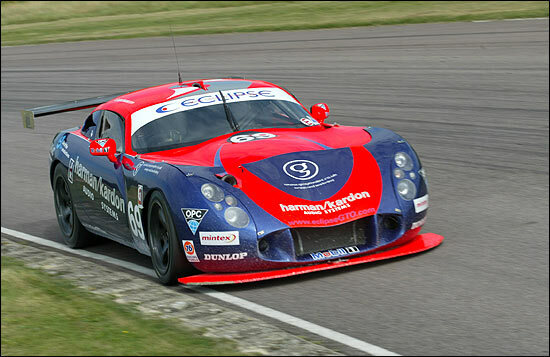 Simon Pullan will join Piers and Shane in the Eclipse TVR. What a season this has been. Championship leaders, two races left.